Water flows from Irish taps for free, reflecting the abundance that pours from the skies. But the fiscally strapped Irish government is changing this by starting to charge citizens for the water they use, something other European nations already do. An immense backlash has ensued, with recent protests by tens of thousands of demonstrators roiling politics at the highest levels. 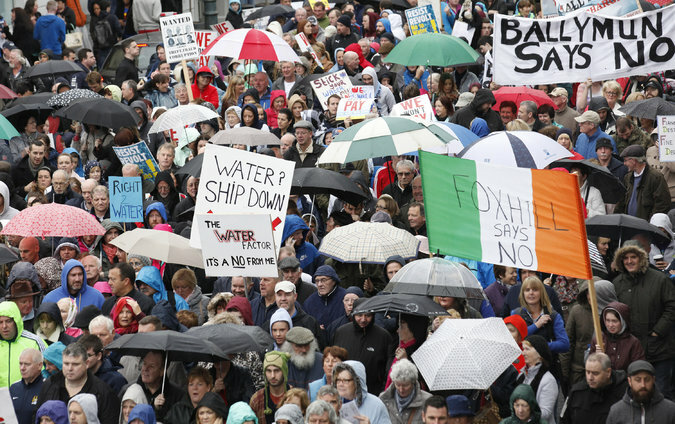 “We believe that water is a human right,” said Brendan Ogle, a Dublin organizer for the protest campaign Right2Water. Charging for water, he said, would harm those who could not afford it. Economists almost universally believe that charging households for the water they use makes sense. After all, citizens pay anyhow, through taxes, to have their water collected, treated, delivered and carried away as wastewater. Charging on the basis of use encourages conservation, which, in this era of climate change, is a good idea even for rainy nations like Ireland, economists say. Dublin occasionally experiences water shortages, though these are largely because of infrastructure problems, not lack of rain. “When people think water is free, they use much more water than is necessary,” said Asit K. Biswas, an international water expert who founded the Third World Center for Water Management, based in Mexico. As an example, he cited the Gulf nation of Qatar: Locals there, who get water for free, use far more than foreigners, who pay for water. In many American and European cities, billing is structured so that heavy users — like those with lawns or swimming pools — pay a higher rate, while frugal users pay a lower one. Unlike most other parts of the European Union, Ireland imposes no household charges for water, and on a per-person basis, the amount of fresh water used for households and businesses is higher than in most other European nations, according to figures compiled by Eurostat, the European Union’s statistics agency. Water use across Ireland is estimated to be about 38 gallons per person per day. “Ireland has been an outlier, because they have this principle that drinking water is — should be — a free public good,” said Roy Brouwer, who heads the department of environmental economics at the Institute for Environmental Studies at VU University in Amsterdam. The Irish pay bills for electricity and trash pickup, though when the trash charges, called bin taxes, were introduced more than a decade ago, there were large protests. Mr. Ogle, of Right2Water, said his group supported paying for water through progressive taxation. The key issue is not, he said, the amount of water that the Irish use, but rather the lack of investment in the nation’s leaky water system. “If we allow water to be turned into a commodity — and the inevitable privatization — water will be used as a wealth creation measure,” benefiting few and harming many, he said. The water charges, which took effect last month and will start showing up on bills early next year, were introduced by the Irish government under pressure from the European Union, the European Central Bank and the International Monetary Fund, which made the charges a condition of Ireland’s 2010 bailout in the banking and debt crisis, according to Michael Marsh, a emeritus professor of political science at Trinity College Dublin. So the new system is arriving after a long stretch of hard times. There has been considerable uncertainty about how much the new charges will cost households. Tales of bonuses to employees of Irish Water, a new utility set up to handle the national system, have stirred anger, as has Irish Water’s plan to install meters to measure use. And yet, he said, Ireland’s previous method of managing water — through nearly three dozen local authorities — was inefficient. Irish Water will continue to be publicly owned, Mr. Kelly said, and the charges “will be modest, fair and affordable” — in other words, probably less than the $600 to $1,000 per year that rumors have cited. Currently, charges would amount on average to almost $350 per year for households with two adults and two children, according to Irish Water. Under pressure from the protests, however, the government plans to provide new details on the charges soon. One difficulty is that Ireland is governed by a coalition that “shows little sign of being able to deal decisively with the issue,” Dr. Marsh said. He anticipates that a resolution may be a relatively low, flat-rate payment for water. But economists say that kind of payment structure does little to encourage conservation. Ireland is not alone. People in most parts of the developing world do not pay water charges, according to Dr. Biswas, the water expert, but some do and have found that there are benefits. In Phnom Penh, the Cambodian capital, the water supply system has greatly improved since household water charges became effective in 1997, said Dr. Biswas, who advised the Cambodian government on the project. Now, the water is clean and works around the clock, with minimal leaks, he said. Some major European cities, including Berlin, Munich and Hamburg in Germany, and Copenhagen, make profits on their water and wastewater charges and may use the extra money to subsidize other municipal services, Dr. Biswas said. In Ireland, the show will go on. This article was published by THE NEW YORK TIMES, November 12, 2014.